If you think of liver only as a rich source of iron, then consider this: It contains significantly more vitamin B-12 and vitamin A than iron. These nutrients help support healthy eyes and skin, boost your immune system and produce red blood cells. In spite of liver's nutritional benefits, there is a trade-off: All types of liver are high in cholesterol. Your body depends on vitamin B-12 to make red blood cells and to turn the amino acid homocysteine into the protein-building amino acid methionine. As vitamin B-12 helps make that conversion, the levels of homocysteine in your blood go down. This is important for your health because high levels of homocysteine damage your arteries, according to FamilyDoctor.org. A 3-ounce serving of beef, lamb or veal liver supplies 60, 65 and 72 micrograms of vitamin B-12, respectively. The same portion of chicken liver contains 14 micrograms. They all provide significantly more than the recommended dietary allowance of 2.4 micrograms daily, as set by the Food and Nutrition Board of the Institute of Medicine. Copper is a functional component of a variety of enzymes. Your body depends on these cuproenzymes to produce energy, metabolize iron, synthesize collagen and keep nerves healthy, according to the Linus Pauling Institute. Some copper-dependent enzymes also make antioxidants, which protect cells from damage caused by free radicals. You only need to get 0.9 milligrams of copper through your daily diet. If you eat a 3-ounce serving of liver from beef or veal, you'll get 12 milligrams. Lamb liver has only half that amount, while chicken liver doesn't even have 1 milligram. Veal liver contains nearly 60,000 international units, or IU, of vitamin A in a 3-ounce serving. The same portion of beef liver has 26,957 IU, while lamb liver has 21,203 IU and chicken liver supplies 11,329 IU. You only need to consume 2,333 to 3,000 IU daily, according to recommendations established by the Food and Nutrition Board. Vitamin A is essential for night vision, but it also plays a variety of other roles, such as synthesizing red blood cells and regulating genes. Without enough vitamin A, your immune system may weaken because the vitamin is essential for the normal growth of white blood cells, according to the Linus Pauling Institute. A 3-ounce serving of beef or veal liver has 162 calories and 5 grams of total fat. Lamb liver contains 187 calories and 7.5 grams of fat, while chicken liver has 142 calories and 5.5 grams of fat. Even though the total fat content of these livers is relatively low and they have 21 to 26 grams of protein per serving, they do not qualify as lean protein because they're high in cholesterol. Healthy adults should consume less than 300 milligrams of cholesterol daily, according to the American Heart Association. Beef liver has 337 milligrams of cholesterol in a 3-ounce serving. 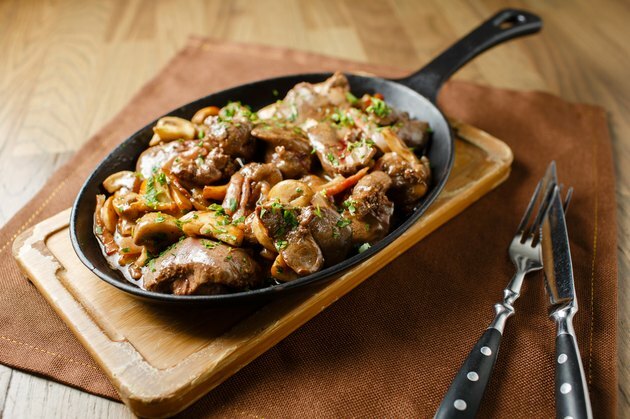 Veal and lamb liver are both in the range of 430 milligrams, while chicken liver has 479 milligrams of cholesterol. Regular consumption of 3-ounce servings of beef liver could cause copper and vitamin A to build to toxic levels. Copper toxicity is rare in healthy adults, but it can lead to liver damage, so you should limit your daily copper intake to 10 milligrams. The type of vitamin A in liver -- retinol -- may become toxic if you take in high doses over a short period of time, or you get lower doses over a long time. The upper tolerable intake for vitamin A is 10,000 international units daily.